Data refers to the concept, fact, or an instruction presented in a defined method. On the other hand, information is organization and interpretation of structured data. Data and information are always found to be intricately tied to each other. Combined analysis of data and information provides a deeper insight to understand what is going on with a particular situation or phenomena. Owing to the development of powerful computational methods, organization of the data and information extraction has now become effortless and expeditious. Computational algorithms have supported in developing numerous powerful databases, which are helpful in storing, accessing, viewing, analyzing, manipulating, and updating the data. Based on data types, three major classes of database models are available, i.e., logical (e.g., object-oriented and relational model), physical (e.g., flat file), and specialized (e.g., XML) databases. Among these, relational model database (SQL) is the most commonly used one for formatting and interpreting the data. At present, biological and medical science research fields have witnessed unprecedented technological advances, due to which data is growing exponentially. However, this large volume of biological data is of little use, if it is not properly stored, organized, and handled. Hence, there is a natural demand for diverse and powerful bioinformatic databases for managing this staggering volume of biological data. 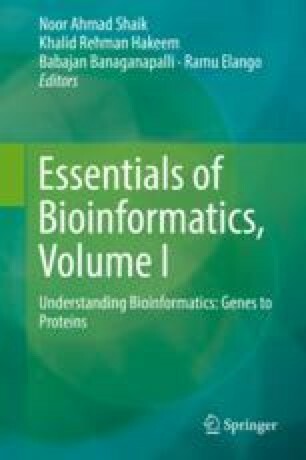 This chapter introduces the readers to some basic concepts about biological databases including their types and designs, as well as information retrieval procedures. This chapter basically focuses on important biological databases like GenBank.